Abstract: Energy transitions have led to major advances in human wellbeing. However, little evidence exists about the scale of the net benefits. By developing a new method for identifying the demand curve, and by using a unique, historical data set, this paper estimates the consumer surplus associated with heating, transport and lighting over more than two hundred years and identifies the gains from a number of key energy transitions. For certain energy transitions, the increase was dramatic, reflecting the transformations in society and lifestyles that mobility and illumination provided in the nineteenth and twentieth centuries. Yet, the net benefits related to heating technologies only rose modestly. Finally, due to saturation effects of the demand for energy services, future technological developments and energy transitions may benefit consumers (though not necessarily society as a whole) less than those in the past. The current research focus in energy transitions is mainly motivated by the environmental implications of energy consumption. This more than justified direction has relegated to a second place the analysis of the enormous benefits derived from energy transitions, specially when we observe consumers’ welfare. This new paper by Roger Fouquet analyses the positive impacts of energy transitions (hereafter, ET) by looking into how each ET generates consumer surplus. This paper combines data sets from two previous works of the author about the United Kingdom on service prices between 1300 and 2010 (Fouquet 2011a), and service consumption between 1700 and 2010 (Fouquet 2014). The data sources and methodologies used were explained in Fouquet (2008). In brief, Fouquet has done an upgrade of his former estimations to measure how much welfare we have obtained by ET. The author follows a standard measure of welfare (how less consumers pay for a specific service) and he applies it to each ET during the last two centuries in the United Kingdom. As shown in the examples in Figure 1, a key advantage of focusing on energy services, rather than on fuels (energy carriers), is that the demand for services remains comparable with the introduction of new goods and technologies. Attempts to estimate consumer surplus face enormous challenges, mainly by the effects of disruptive technologies. However, it could be possible to get an approximation taking into account the methodology used by Nordhaus (1997). Moreover, the paper presents a novel method that allows to identify the changes in demand curves for energy services (lightning, heating and transport). There were dramatic increases in consumer surplus due to energy transition in transport (stagecoaches to railways) and lightning (candles to gaslight and to electric lightning). Developing countries are benefited by increasing energy consumption. On the other hand, benefits in developed countries could be lower than in the past. The method offered allow us to forecast the long-run net benefits of new energy technologies and transitions. This issue has enormous policy implications in relation with the environmental challenges that we are facing us. Currently, to defend energy systems/consumption as mechanisms of progress and development is quite complicated, specially if the energy systems contain fossil fuels, such as the main energy carriers in the case of the United Kingdom. This paper focuses its attention on the “good side” of energy consumption and mechanization, tackling a compulsory debate on the trade-off between economic development and sustainability. Roger Fouquet has mentioned this debate in an 2016 article, where he analyzed the lessons from history to our current energy transition. Now, Fouquet has demonstrated, accounting for the consumer surplus, than previous energy transitions have been beneficial for consumers/population. The question is: how should the current and future energy transition be carried? In order to achieve economic development, countries pursuing higher income levels require an increase in energy consumption. Fossil fuels still are a valid option to increase energy consumption; a low carbon economy could be farther in the road than we thought. A challenge to global society is to create an economic environment favorable to clean energy technologies, in order to promote economic growth in low income regions without the deprivation of our natural resources and environment. As this paper has shown us, there are periods when the increase in energy consumption has been beneficial to aggregate welfare, at least from a country/region perspective. However, the current global situation doesn’t allow an increase in energy consumption based in fossil fuels without risking main environmental equilibriums. The only possible criticism to the paper is the implicit “normative” scope supported by one country experience. Nevertheless, Fouquet presented this paper as a starting point for further research. Fouquet, R. (2011a) “Divergences in Long Run Trends in the Prices of Energy and Energy Services.” Review of Environmental Economics and Policy 5(2) 196-218. Fouquet, R. (2014) “Long Run Demand for Energy Services: Income and Price Elasticities over 200 Years.” Review of Environmental Economics and Policy 8(2) 186-207. Fouquet, R. (2008) Heat Power and Light: Revolutions in Energy Services. Cheltenham: Edward Elgar. This entry was posted in Economic History, UK and tagged consumer surplus, energy transitions, heating, lighting, transport on 2018-02-22 by tambo0986. Abstract Rogue trading has been a persistent feature of international financial markets over the past thirty years, but there is remarkably little historical treatment of this phenomenon. 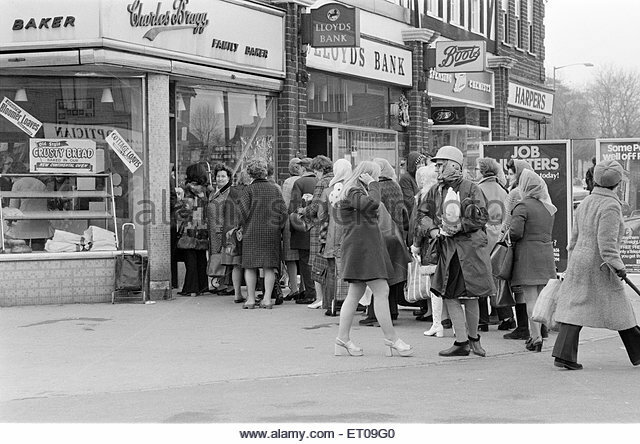 To begin to fill this gap, evidence from company and official archives is used to expose the anatomy of a rogue trading scandal at Lloyds Bank International in 1974. The rush to internationalize, the conflict between rules and norms, and the failure of internal and external checks all contributed to the largest single loss of any British bank to that time. The analysis highlights the dangers of inconsistent norms and rules even when personal financial gain is not the main motive for fraud, and shows the important links between operational and market risk. This scandal had an important role in alerting the Bank of England and U.K. Treasury to gaps in prudential supervision at the end of the Bretton Woods pegged exchange-rate system. Business History Review, Volume 91 (1 – April 2017): 105-128. 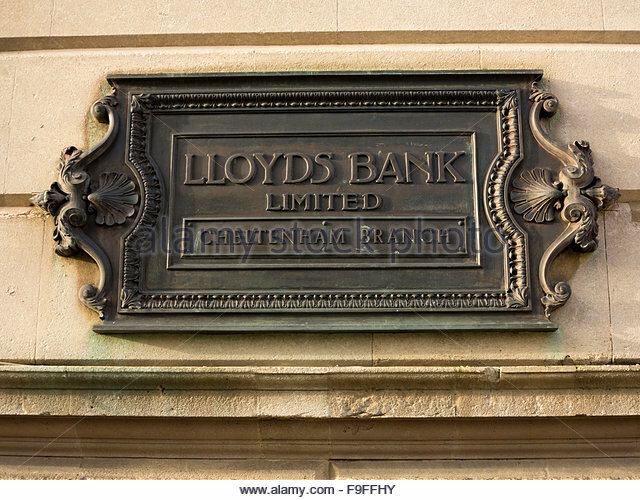 Since the 1974 rogue trading scandal at Lloyds’s Lugano branch we have seen more spectacular sums lost in rogue trading scandals. What Dr Catherine Schenk brings to our understanding of these recurrent events is the insight that only drawing on archives, both at Lloyds and at the Bank of England, can bring. In particular, the archives illuminate the decision processes at both institutions as the crisis unfolded. I have little to add to her thorough exposition of the detail so below I will limit myself to imprecise generalities. Marc Colombo, the rogue trader at Lloyds Lugano, was a peripheral individual in a peripheral product line, in a peripheral location. As Schenk finds, this peripherality has two consequences, the rogue trader’s quest for respect, and the problem of supervision. Lloyds Lugano is not an anomaly. An examination of several other cases (e.g. Allied Irish, Barings, Daiwa, and Sumitomo Trading), finds the same thing (Tschoegl 2004). In firms, respect and power come from being a revenue center. Being a cost center is the worst position, but being a profit center with a mandate to do very little is not much better. The rogue traders that have garnered the most attention, in large part because of the scale of their losses were not malevolent. They wanted to be valued. They were able to get away with their trading for long enough to do serious damage because of a lack of supervision, a lack that existed because of the traders’ peripherality. In several cases, Colombo’s amongst them, the trader was head of essentially a one-person operation that was independent of the rest of the local organization. That meant that the trader’s immediate local supervisor had little or no experience with trading. Heads of branches in a commercial bank come from commercial banking, especially commercial lending. Commercial lending is a slow feedback environment (it may take a long time for a bad decision to manifest itself), and so uses a system of multiple approvals. Trading is a fast feedback environment. The two environments draw different personality types and have quite different procedures, with the trading environment giving traders a great deal of autonomy within set parameters, an issue Schenk addresses and that we will discuss shortly. Commonly, traders will report to a remote head of trading and to the local branch manager, with the primary line being to the head of trading, and the secondary line being to the local branch manager. This matrix management developed to address the problem of the need to manage and coordinate centrally but also respond locally, but matrix management has its limitations too. As Mathew points out in the New Testament, “No man can serve two masters, for either he will hate the one, and love the other; or else he will hold to the one, and despise the other” (Matthew (6:24). Even short of this, the issue that can arise, as it did at Lloyds Luggano, is that the trader is remote from both managers, one because of distance (and often time zone), and the other because of unfamiliarity with the product line. A number of software developments have improved the situation since 1974, but as some recent scandals have shown, they are fallible. Furthermore, the issue still remains that at some point the heads of many product lines will report to someone who rose in a different product line, which brings up the spectre of “too complex to manage”. The issue of precautionary or governance rules, and their non-enforcement, is a clear theme in Schenk’s paper. Like the problem of supervision, this too is an issue where one can only do better or worse, but not solve. All rules have their cost. The largest may be an opportunity cost. Governance rules exist to reduce variance, but that means the price of reducing bad outcomes is the lower occurrence of good outcomes. While it is true, as one of Schenk’s interviewees points out, that one does not hear of successful rogue traders being fired, that does not mean that firms do not respond negatively to success. I happened to be working for SBCI, an investment banking arm of Swiss Bank Corporation (SBC), at the time of SBC’s acquisition in 1992 of O’Connor Partners, a Chicago-based derivatives trading house. I had the opportunity to speak with O’Conner’s head of training when O’Connor stationed a team of traders at SBCI in Tokyo. He said that the firm examined too large wins as intently as they examined too large losses: in either case an unexpectedly large outcome meant that either the firm had mis-modelled the trade, or the trader had gone outside their limits. Furthermore, what they looked for in traders was the ability to walk away from a losing bet. But even small costs can be a problem for a small operation. When I started to work for Security Pacific National Bank in 1976, my supervisor explained my employment benefits to me. I was authorized two weeks of paid leave per annum. When I asked if I could split up the time he replied that Federal Reserve regulations required that the two weeks be continuous so that someone would have to fill in for the absent employee. Even though most of the major rogue trading scandals arose and collapsed within a calendar year, the shadow of the future might well have discouraged the traders, or led them to reveal the problem earlier. Still, for a one-person operation, management might (and in some rogue trading scandals did), take the position that finding someone to fill in and bring them in on temporary duty was unnecessarily cumbersome and expensive. After all, the trader to be replaced was a dedicated, conscientious employee, witness his willingness to forego any vacation. Finally, an issue one needs to keep in mind in deciding how much to expend on prevention is that speculative trading is a zero-sum activity. A well-diversified shareholder who owns both the employer of the rogue trader and the employers of their counterparties suffers little loss. The losses to Lloyds Lugano were gains to, inter alia, Crédit Lyonnais. There is leakage. Some of the gainers are privately held hedge funds and the like. Traders at the counterparties receive bonuses not for skill but merely for taking the opposite side of the incompetent rogue trader’s orders. Lastly, shareholders of the rogue traders firm suffer deadweight losses of bankruptcy when the firm, such as Barings, goes bankrupt. Still, as Krawiec (2000) points out, for regulators the social benefit of preventing losses to rogue traders may not exceed the cost. To the degree that costs matter to managers, but not shareholders, managers should bear the costs via reduced salaries. Chesterton, G. K. (1929) ‘’The Thing: Why I Am A Catholic’’, Ch. IV: “The Drift From Domesticity”. Krawiec, K.D. 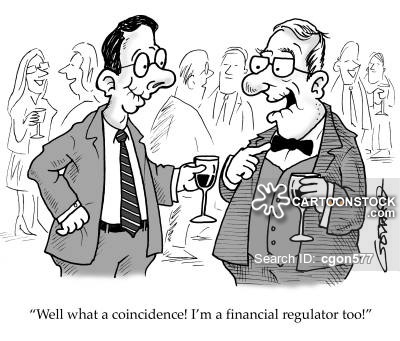 (2000): “Accounting for Greed: Unraveling the Rogue Trader Mystery”, Oregon Law Review 79 (2):301-339. This entry was posted in banking, Britain, Business & Management, Business history, Business History Review, Economic History, Europe, Financial crisis, Globalization, Guest contribution, Guest entry, Institutions, Money & Banking, Peer reviewed article, UK and tagged business history, corporate governance, Europe, financial history, globalization, money, UK on 2017-05-16 by bbatiz. Little Britain? Empire and the rise of protectionism in interwar Britain. International trade became much less multilateral during the 1930s. Previous studies, looking at aggregate trade flows, have argued that discriminatory trade policies had comparatively little to do with this. Using highly disaggregated information on the UK’s imports and trade policies, we find that policy can explain the majority of Britain’s shift towards Imperial imports in the 1930s. Trade policy mattered, a lot. This paper provides an interesting insight into tariffs, and their role in interwar Britain from a perspective that has not been previously examined. An examination of this issue is timely, especially with the debates surrounding the implication of Britain’s withdrawal from the European Union, and the threats issued by the American Trump administration concerning future trade policy. It demonstrates that the impact of tariffs during the economic crises of the 1930s had a variable impact, and did not always achieve their intended outcome. In this respect, the impact of punitive trade policies from a historical perspective can provide a very important context to future negotiations as the world becomes acclimatised to a very different political landscape. 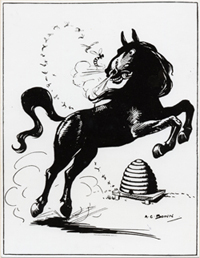 Tariff reform was a huge issue for the British government in the early twentieth century, and the subject of significant political propaganda. The paper is deeply researched, and draws on a wide collection of data. One of the main conclusions is that trade blocs made very little difference, nor did the imperial preference scheme, to the balance and nature of the British economy in the crisis years. However, it does show that the change in the nature of trade, away from free trade to focusing specifically on empire did have specific outcomes that shaped the direction of the British economy, but that these changes were caused specifically by trade policy rather than anything else. Indeed, the authors show that as a result of the changing nature of the British government’s trade policy, a 70% increase in empire trade was reported in the period 1930-33. In this respect, the paper poses a very interesting question that is addressed, but will need further historical enquiry: Did trade policy contribute to return of intra-Imperial trade? The paper looks at a range of policies pursued by the British government in the period after the First World War, some of which were discriminatory, in order to evaluate the nature of its economic and trade development. In compiling their conclusions, a huge amount of data was analysed, including data sets from 42 countries examining 200 products categories between 1924-1938. The data showed that dramatic changes were seen in the nature of Britain’s trade and economic policy in the period 1931-33. Nevertheless, these changes had long roots. The abolition of free trade after the First World War saw the introduction of the McKenna Duty, which imposed a 33.5% tariff on cars, clocks, watches, films and musical instruments ad valorem (based on the value of the goods). This was later intensified with the implementation of the 1921 Safeguarding of Industries Act, where a 33.5% tariff was placed on the imports of key goods. However, despite the apparent punitive nature of these policies, the British economy was largely Liberal up to 1930, when the Abnormal Importations Act allowed 100% tax on all manufactured goods from outside the empire. Utilising goods from the empire was seen as an excellent opportunity for the British government to stablilise its economy during the challenges of the Great Depression. Realising the potential difficulties that such a punitive law could unleash, a more compassionate deal was reached in the 1932 Import Duties Act, where it was agreed that a 10% tax be imposed on imported goods, although this exempted products from the empire. This concession was achieved with the aim of ensuring improved access to dominion markets, and resulted in several bilateral agreements with Canada, Australia, New Zealand, South Africa, Newfoundland, India and Southern Rhodesia. Nevertheless, with the introduction of quotas for agricultural products through the Agricultural Marketing Acts of 1931 and 1933, there were now restrictions on the type of farming products that could be imported. Moreover, in a tone that is reminiscent of the pro-Brexit camp both during and after the referendum, the British explored deals that went beyond the traditional confines of Europe in order to strengthen its economy, and this included Scandinavian countries and Argentina. This not only improved British trade prospects, but provided the mutually-beneficial element to these countries in order to maintain access to the British market for the purpose of trade. The 1932 Import Duties Act was seen by many as symbolic of punitive protectionist policies pursued by the British government. There are so many fantastic elements to this paper that not only shed new light on the issue of tariffs, but also provide the foundation for future debate. Nevertheless, the authors have highlighted what they believed were the difficulties in their research, especially concerning the masses of data that they collected. They believed that there were inconsistencies in the data, but have done a wonderful job in using spreadsheets to predict the results in the absence of concrete data. In some cases, the use of complicated mathematical formulas has been used to come to these conclusions. The fact that the paper engages in counterfactual debate provides an important foundation for future discussion, but also lends itself to its own difficulties. Counterfactuals, although interesting, cannot be definitively proven. In this respect, the paper poses several “what if” questions relating to tariffs, especially what would have happened if tariffs had not been increased. In their conclusions, they argue that it appears that the empire did better with tariffs than without, and if there was free trade, there would only have been a modest increase in the empire share of trade. Thus, the impact of British protectionist policies proved substantial, and, they argue, account for a shift of around 50% of trade towards the empire by 1930. The conclusions are interesting and useful, but as the authors explain, a lot of work needed to be done to fill the gaps in the data. It is the interpretation of these gaps in the data, especially the ways in which some conclusions have been reached through the use of counterfactual debate that will undoubtedly provide the platform for future historical enquiry on this topic. Eichengreen, Barry, and Douglas A. Irwin. The slide to protectionism in the Great Depression: Who succumbed and why?. No. w15142. National Bureau of Economic Research, 2009. Capie, Forrest. Depression & Protectionism: Britain Between the Wars. Vol. 2. Routledge, 2013. Temin, Peter. Lessons from the great depression. MIT Press, 1991. This entry was posted in Britain, UK and tagged British Empire, economic crises, Great Depression, interwar period, tariffs, trade, trade policy on 2017-04-04 by crowleymarkj. Abstract: Since the 1970’s, both politically and theoretically, neoliberalism as an ideology has been on a persistent rise to the point where, in the twenty first century, it has garnered hegemonic dominance. Despite several recurring crises in countries since the ascendance of neoliberalism, we yet remain reluctant to point out the political economy philosophy as a root cause of the crises. Instead, many of the academics within Economics prefer to offer bouts of highly technical reasons for the downturn – this is especially true and almost solely applicable to those who practice within the ‘neoclassical’ conjecture of Economics. In a typical Marxian sense, one would have to look no further than the economic system to determine both economic and social outcomes of a country. What dictates that economic system however is the political philosophy of the leaders who guide the economic system – the policy makers. This paper attempts to show the neoliberal political philosophy, as the common thread for major crises within the last two decades. It also proposes a societal trinity for which change is driven through complex interactions among the political, economic and social spheres. Richard Rambarran joins an emerging group of scholars that are spearheading an aggressive global criticism of modern capitalism, and particularly the impact that neoliberalism has had on its most recent methods of implementation within the international system. Thomas Picketty’s Capitalism in the Twenty-First Century has lead the way in recent times. Nevertheless Rambarran’s contribution to the discussion is welcomed because it points out that the economic political philosophy behind the social construction of neoliberal ideals is the determinant factor in preserving <status quo, even after numerous economic crises. From Rambarran’s point of view, the neoliberal principles have become an “ingrained” ideology fomented by economists, local politicians and bureaucrats, domestic and multilateral institutions, academic institutions, mass media, corporations, and the consumer. He further argues that today’s mainstream professional economist has perpetuated this social construction using its mathematical and econometric technical rhetoric to distance itself not only from the public sphere but also from the critical role once played by the “Classical economists.” The complacency in the professional sphere has permeated the public sphere, where the collective political and social conscience is more concerned in pursuing the possibility of “wealth and great opulence,” occasionally reacting to economic crises like the one in 2008 only to quickly return to the initial passive approach once individual financial issues are partially resolved. Rambarran centers on the 1997 East Asian crisis and the 2008 Global Financial Meltdown in order to illustrate how the economic political philosophy has come to dictate “the very mechanics of our lives” through its systemic and institutional framework. He argues that contrary to the views of many scholars that the rise of neoliberalism came with the emergence of political leaders Ronald Reagan and Margret Thatcher, the foundations of the political philosophy and its social construction emerged in the post Great Depression era. The solutions to the 1997 and 2008 crises therefore represent a series of theoretical models constructed since the first modern global financial crisis in order to scientifically justify the perpetuation of neoliberalism. The ingrained idea that “human well-being and social welfare” are best advanced by the deregulation of the institutions, programs, and norms that once regulated the capitalist machine, seems to be an unquestionable thought. To get to this social reality, argues Rambarran, classic liberal ideas of John Locke, Adam Smith, David Ricardo and the like had to be dismantled in order to neoliberalism to surge. According to Rambarran, neoliberalism is “not simply a minutely revised version of classic liberalism,” it is a new version of capitalism that reduces the role of the state to its minimal. The business-government alliance that pushed neoliberalism forward after the 1930s slowly twisted the idea that “liberating individual and entrepreneurial freedoms and skills” through institutions, programs, and a normative systems “characterized by strong private property rights, free markets, and free trade” were actually responsible for the debacle of the market system in 1997 and 2008, and that greater privatization of services and deregulation for the business sector was the only solution moving forward. These are the principles of nation state building under globalization, the basic political economic structures of nations that welcome open market and free trade, the minimal parameters for participating in the global market system; ideas that, as indicted by Rambarran, are part of the subconscious decision making dynamic between politicians, the private sector, and consumers. 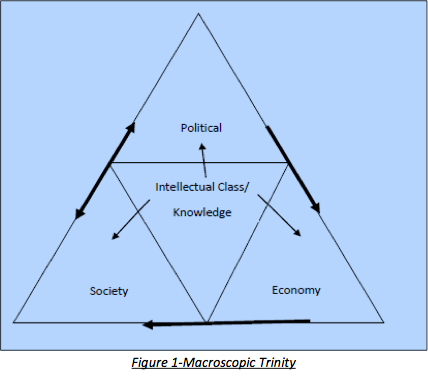 The current realities of this “macroscopic trinity” indicate that the business class, defined by Rambarran as the “intellectual class,” heavily influences political, economic, and social perceptions of nation building under a globalized system. An intellectual class responsible for the cultural social construction of neoliberal principles that originated in the industrial world during the first half of the twentieth century and that began to spread across the developing world after the Second World War. Neoliberal economists obsessed with breaking the chains of state regulatory systems and interested in returning to the deregulated conditions of the pre Great Depression era used theoretical models to debunk Keynesian economics. 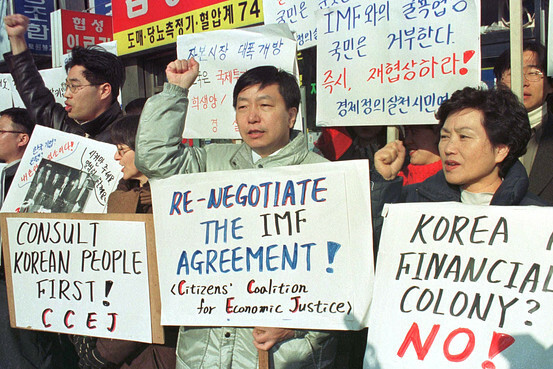 During the 1970s and 1980s neoliberal principles became the formula for stagflation in the highly developed countries, and the remedy for the increasing external debt crisis across the developing world. 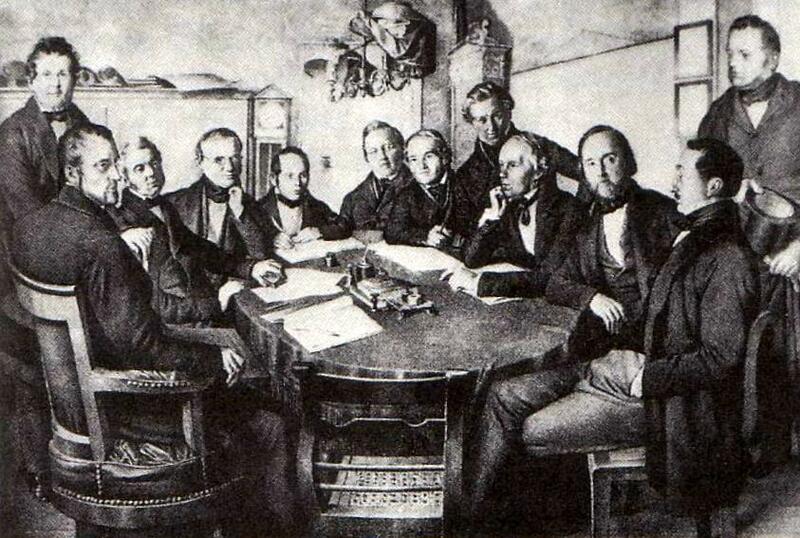 The effective release of the forces of the market justified the dismantling of the social welfare state and the institutional and programmatic bodies that awarded citizens levels of accountability within the triangular dynamic of government-business-constituent relationships across the world. Nationalist development models based on Import Substitution Industrialization were dismantled and replaced by the principles of deregulation, privatization, and the strengthening of private property rights. According to Rambarran, the implementation of the neoliberal experiment across the world produced mixed results, but the ability of the intellectual class to market success stories through its propaganda machine in order to justify the long-term preservation and expansion of neoliberal principles across the world gave birth to the Asian miracle. 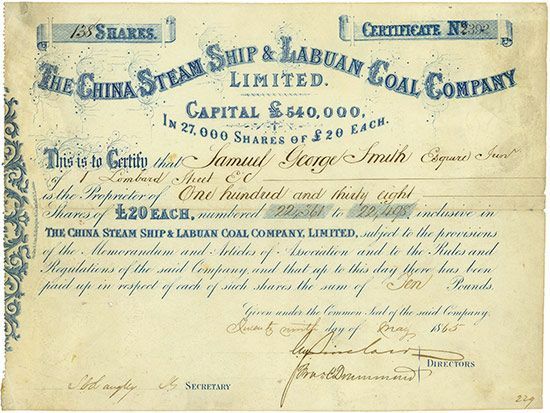 Foreign direct investment and the “inflow of speculative money” would be the driving force behind the miracle, as capitalists in the industrial world shifted their production and manufacturing operations to newly unregulated regions of the world while at the same time taking advantage of the liberalization of capital accounts, escaping the already fragile regulatory systems in their own nation states, and setting the tone for the initial stages of accelerated “neoliberal globalization.” Once the “speculative bubble…popped” foreign investors quickly pulled their money from the region, decreasing confidence in the East Asian region. The neoliberal experiment had revealed the need for regulatory systems in order to impede the emergence of new unregulated speculative markets across the world under a more interdependent global market system, but the reshuffling of capital back into the industrial economies allowed the neoliberal propaganda system to quickly market the success of Free Trade zones. Rambarran misses the opportunity to explain the historical developments that took place between the Asian crisis of 1997 and the 2008 Global Financial Crisis that pushed neoliberalism further into the collective subconscious. Discussions about the emergence of the Canada-United States Free Trade Agreement, the North American Free Trade Agreement, and the consolidation of the European Union would have allowed the author an opportunity to illustrate how neoliberal intellectuals engineered and marketed to their constituents the illusion of a globalized economy for the sake of the consumer and the domestic worker. The author’s lack of historical evidence makes his argument less convincing. The 1997 and 2008 crises help illustrate how neoliberal forces are able to perpetuate their principles even after severe global economic, political, and social damage, but he is not able to explain how the intellectual forces within his “macroscopic trinity” were able to create the social cultural construction that turned neoliberalism into an unquestionable economic political philosophy. For example how neoliberal economists such as Milton Friedman and Lauchlin Currie together with multilateral organizations engineered the expansion of neoliberalism to markets across the world. How marketing and public relations intellectuals such as Philip Kotler and Daniel Edelman perfected the use of mass media in order translate the principles of neoliberalism to consumers, distancing them from their role as constituents and shifting their agency toward the world of consumption. How the roles of politicians and bureaucrats was redefined by Thatcher and Reagan in order to reinvent the democratic relationship between representative and constituent, and how the educational system at all levels was reengineered in order to replicate and export neoliberal ideals across the world. A more detailed explanation of the concepts behind his “social trinity” would have clarified the dynamics between the intellectual class, and political, economic, and social actors. Why is there a one-way communication dynamic between economic actors and society? Why is the communication between political and economic actors a one-way dynamic? And why is the intellectual class not present within the political, economic, and social realms but separate from them? I would argue that the success of the expansion of neoliberal thought is that they now represent government, economic policy, and the collective social conscience. It is why it is more prevalent then ever before to see private sector representatives running for office, managing government institutions, and redefining the nature of once sacred social institutions such as universities. It is not a phenomenon of the industrial world but a common trend across the global system. Duménil, G. & Levy, D. “Neoliberal (Counter) Revolution.” In D. Johnston & A. Saad-Filho, Neoliberalism: A Critical Reader. London: Pluto Press, 2004, pp. 9-19. Harvey, D. A Brief History of Neoliberalism. London, United Kingdom: Oxford University Press, 2007. 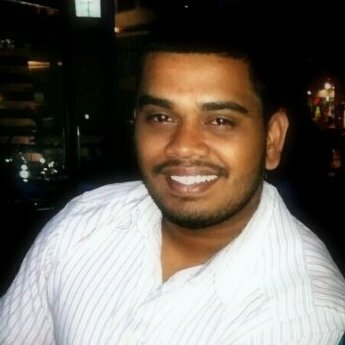 Rambarran,R. “Crisis without End: Neoliberalism in a Globalized Environment Modeling the Historic Rise of Neoliberalism and its Systematic Role in Recent Economic Downturns,” Munich Personal RePEc Archive, October 22, 2015. Palley, T. I. “From Keynesianism to Neoliberalism: Shifting Paradigms in Economics.” In D. Johnston & A. Saad-Filho, Neoliberalism: A Critical Reader. London: Pluto Press, 2004, pp. 20-29. Picketty, T. Capitalism in the Twenty-First Century. Cambridge MA: Harvard University Press, 2014. Rambarran, “Crisis without End”, p. 1. For more information see Harvey 2007, Palley 2004 and Dumeril & Levy 2004. This entry was posted in Development, Economic growth, Economic History, Financial crisis, Globalization, History of Economic Thought, Inequality, Institutions, Political Economy, UK, United States on 2015-11-17 by Stefano Tijerina. Abstract: Although Japanese economic growth after the Meiji Restoration is often characterised as a gradual process of trend acceleration, comparison with the United States suggests that catching-up only really started after 1950, due to the unusually dynamic performance of the US economy before 1950. A comparison with the United Kingdom, still the world productivity leader in 1868, reveals an earlier period of Japanese catching up between the 1890s and the 1920s, with a pause between the 1920s and the 1940s. Furthermore, this earlier process of catching up was driven by the dynamic productivity performance of Japanese manufacturing, which is also obscured by a comparison with the United States. Japan overtook the UK as a major exporter of manufactured goods not simply by catching-up in labour productivity terms, but by holding the growth of real wages below the growth of labour productivity so as to enjoy a unit labour cost advantage. Accounting for levels differences in labour productivity between Japan and the United Kingdom reveals an important role for capital in the catching-up process, casting doubt on the characterisation of Japan as following a distinctive Asian path of labour intensive industrialisation. Broadberry, Fukao, and Zammit focus our attention on productivity comparisons between the UK and Japan, departing from existing works on U.S.-Japan comparisons. Broadberry, Fukao, and Zammit argue that previous authors such as Pilat’s reliance on a U.S.-Japan comparison to measure Japan’s productivity has greatly distorted our periodization of Japan’s economic growth (Pilat 1994). This was partly because like Japan, the U.S. grew very quickly between 1870 and 1950, and the effects of the Great Depression in the U.S. also blunted our perception of the relative stagnation of the Japanese economy between 1920 and 1950. 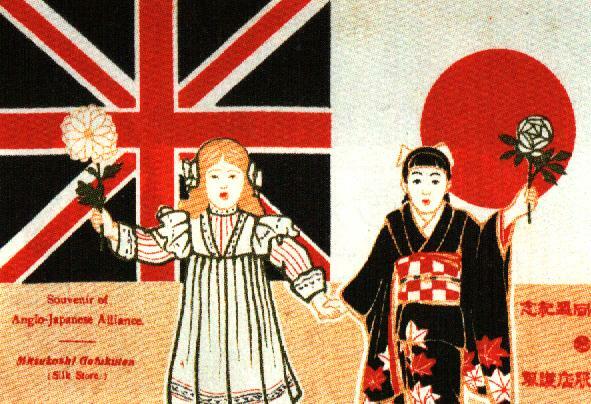 By comparing the Japanese data with that of the UK, Broadberry, Fukao, and Zammit show that Japanese catch-up began in the late nineteenth century during the Meiji period, and stagnated in the interwar period before resuming again after the Second World War. In contrast to Pilat, the authors find that manufacturing played an important role in Japanese growth not only after but also before the Second World War. Whereas strong U.S. improvements in manufacturing (the U.S. itself was undergoing catch-up growth vis-à-vis the UK) might have obscured our view of Japanese performance in these areas, comparison with the UK reveals that Japanese manufacturing performed strongly until 1920. In terms of methodology, Broadberry, Fukao, and Zammit emphasize their use of more than one benchmark for time series projections to provide cross checks, and they selected 1935 and 1997 as benchmarks. One of the most intriguing aspects of the paper is the suggestion that capital played a crucial role in Japan’s experience of catch-up growth. The authors challenge the growing view among economic historians that Asia pursued a distinctive path of economic growth, based on a pre-modern “industrious revolution” (Hayami 1967) and labor intensive industrialization (Austin & Sugihara 2013) in the modern period. Broadberry, Fukao, and Zammit’s data (table 12) shows that across our period, Japan caught up with the UK not only in terms of labor productivity but also capital intensity. Crucially, “by 1979, capital per employee was higher in Japan than in the United Kingdom” (p17). The authors explain this phenomenon by observing that “capital deepening played an important role in explaining labour productivity growth in both countries, but in Japan, the contribution of capital deepening exceeded the contribution of improving efficiency in three of the five periods” (p18). Contrary to the view put forward by those in favor of labor-intensive industrialization, the authors argue, “Japan would not have caught up without increasing [capital] intensity to western levels” (p19). The authors contend that capital played as important a role as labor in shaping Japan’s productivity growth. This paper provides a valuable quantitative contribution to our knowledge of labor productivity in two countries that are highly important in studies on global economic history. The greater intensity of Japan’s external relations with the U.S. in the period after the Second World War has led to scholars’ greater interest in comparisons with the U.S., whereas as Broadberry, Fukao, and Zammit point out, the UK remains one of the main yardsticks in terms of productivity before the Second World War. In this respect, a comparison with the European experience is valuable, and offers a good quantitative basis for illustrating the character of Japan’s industrialization efforts in the period before the Second World War. The conclusion that manufacturing played a key role in Japan’s catch-up growth vis-à-vis the UK is consistent with the historical literature that has foregrounded manufacturing, and in particular exports to Asia, as the main driver of pre-WW2 Japanese economic growth. What is more surprising in this paper, however, is the authors’ contention that capital was the primary factor in Japan’s productivity growth. The authors note that until 1970 Japan enjoyed lower unit labor costs vis-à-vis Britain largely because real wages were artificially repressed beneath the level of labor productivity. It was in the 1970s when Japan started seeing increases in real wages, and as a result its labor cost advantage disappeared until faster real wage growth in the UK in the 1990s (p15). In other words, the authors suggest that Japan’s export success was due not so much to improvements in labor productivity as it was to artificially low labor costs. While Japanese labor productivity growth was not exceptional except between 1950 and 1973, the contribution of capital deepening in Japan (2.29% and 1.32% for 1950-73 and 1973-90, as opposed to 0.67% and 0.58% for the UK; table 13) was on the whole greater or at least as much as that of the UK. While few commentators would dispute the importance of capital in driving economic growth, it is unclear whether the data presented here sustains the conclusion that Japan did not follow a distinctive path of labor-intensive industrialization. The authors cite Allen’s paper on technology and global economic development (Allen 2012) to support their claim that western levels of capital intensity were necessary for productivity-driven growth that is characteristic of advanced industrial economies. While that latter point is well taken, aggregate measures of “capital intensity” do not on their own reflect the types of industries where capital (and other resources) is invested, or the manner in which labor is deployed either to create growth or to generate employment for reasons of political choice or social stability. 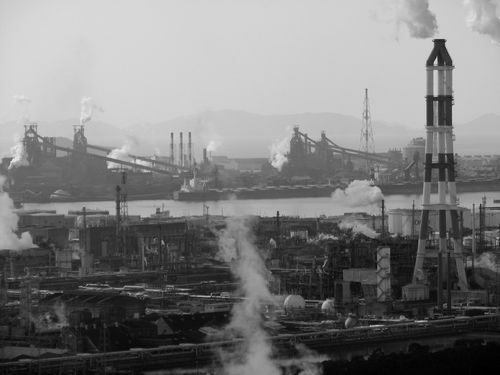 In fact, proponents of the labor-intensive industrialization argument acknowledge that post-WW2 Japan witnessed a step-change in its synthesis of the labor and capital-intensive paths of industrialization, at the same time that Japanese industries often opted for relatively labor-intensive sectors within the spectrum of capital-intensive industries, such as consumer electronics as opposed to military, aerospace, and petro-chemical sectors (e.g. Austin & Sugihara 2013, p43-46). Labor-intensive industrialization does not itself preclude high levels of capital investment, for example consumer electronics, which employs great numbers of individual workers. The key arguments in labor-intensive industrialization are not the role of capital per se, but the constraints imposed by initial factor endowments (e.g. large populations) and the transferability of the model through national industrial policies and intra-Asian flows of ideas and institutions. Broadberry, Fukao, and Zammit do not challenge these core ideas in the model, and confine their critiques to labeling Japan’s technological policy breakthroughs as changes in “flexible production technology” (p. 19). Doing so ignores the basic fact that the balance between population and resources in Japan has little similarity to that in the West, either at the eve of the Industrial Revolution or in the present day. In other words, there is little inherent contradiction between the need for capital accumulation and the selection of industries that make better use of the capital and technology (e.g. “appropriate technology”, Atkinson & Stiglitz 1969 and Basu & Weil 1998). Finally, it seems to me that basing a critique primarily on a comparative study of the advanced economies of the UK and Japan misses a broader point that labor-intensive industrialization is as much about exploring paths that have been overlooked or inadequately theorized because of our simplistic insistence on “convergence” in economic growth. From this angle, foregrounding the subtle but profound differences between successful models of economic development, e.g. the experience of Japan in East Asia, and dominant Western models seems to be at least as valuable as attempts to reproduce the “convergence” argument. Allen, R 2012. “Technology and the Great Divergence: Global Economic Development since 1820,” Explorations in Economic History, vol. 49, pp. 1-16. Atkinson, A & Stiglitz, J 1969. “A New View of Technological Change,” Economic Journal, vol. 79, no. 315, pp. 573-78. Austin, G. & Sugihara, K (eds.) 2013. Labour-Intensive Industrialization in Global History. Abingdon, Oxon. : Routledge. Basu, S & Weil, D, 1998, “Appropriate Technology and Growth,” The Quarterly Journal of Economics, vol. 113, no. 4, p. 1025-54. Hayami, A, 1967. “Keizai shakai no seiretsu to sono tokushitsu” (The formation of economic society and its characteristics”) in Atarashii Edo Jidai shizō o motomete, ed. Shakai Keizaishi Gakkai. Tokyo: Tōyō Keizai Shinpōsha. Pilat, D 1994. The Economics of Rapid Growth: The Experience of Japan and Korea. Cheltenham, Glos. : Edward Elgar Publishing. This entry was posted in Economic growth, Japan, UK and tagged Japan, Labor-intensive industrialization, long-run economic growth, manufacturing, technology, UK on 2015-09-09 by joymanlee.